Stylish upscale place perfect for cocktails before venturing out on the town. Offers a unique combination of Indian traditions and Icelandic ingredients and uses exotic homegrown spices shipped directly from India. 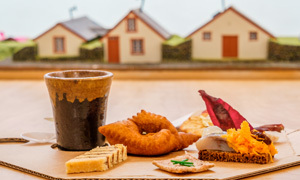 Icelands first and oldest bakary, a small family owned business founded on 25. september 1834. A bakery close to the University of Iceland, the National museum and Hotel Saga. 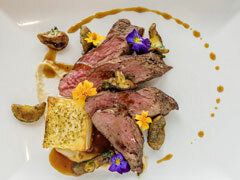 Brasserie Askur is a casual restaurant offering steaks, hamburgers, soups, salads and wine at moderate prices. The Deli is a gourmet trattoria, featuring regional Mediterranean cuisine as well as speciality pizzas, homemade breads and daily hot specials. One of the oldest pizza places in Reykjavik, offering real oven-baked pizza; many claim it's the best pizza in town. We serve morsels from sea and land, all with an international touch and adventurous spirit. Chic ambiance, superb, gastro-style restaurant and gracious service. The presentation of the food is both exciting and artistic. With fresh Icelandic ingredients and spices personally imported from India, the results are simply fabulous. A proud part of the Canopy Reykjavík / City Centre, Geiri Smart is where award-winning chefs come together to create original culinary adventures. A friendly family restaurant which offers many different dishes for a very good price. Hereford Steakhouse is located in the heart of the city and specialises in steaks of all kinds, with a modern and relaxed atmosphere. Hornid, established in 1979, is the oldest Italian-style restaurant in Reykjavik. Italia is one of the oldest Italian restaurants in Reykjavik and offers a varied menu of Italian specialities in a cozy atmosphere. Creative cooking in a relaxing atmosphere in the center of Reykjavík. Kitchen restaurant offers a delicately spiced Nepalese and Indian Grill & Curry. Imagine a modern restaurant serving the best Icelandic ingredients, according to Mediterranean culinary traditions. Kringlukráin started in 1989 as a genuine pub, but gradually it has developed into an 'a la carte' restaurant. Very tasty middle eastern fast food which is very popular among locals in the city. Open until late so its great for late night snacks! Mímir is a vibrant restaurant offering an exotic blend of tastes in food and drinks. We focus on our cooperation with local Icelandic producers and enjoy finding the best seasonal ingredients available from our Icelandic nature. A small noodle bar at the bottom of Skólavörðustígur whose main objective is to offer fast food that is both healthy and tasty. Plates of sushi pass by (what is known as kaiten sushi) and diners grab as many as they desire. A brasserie-style restaurant serving Icelandic and international food, with a fish buffet every day. A Naples-style restaurant offering real Italian cuisine in the heart of the city. Shalimar is a casual and reasonably priced Indian-Pakistani restaurant located right in the city centre. It was in 2010 that a young lad from húsavík, a little fishing town up north, was awarded the title, Chef of the Year. Icelandic pristine seasonal ingredients subtly immersed in exotic spices – adding luscious and inspiring influences from Lebanon and Morocco. The Lobster House (Humarhusid) has a reputation as one of the country’s most popular restaurants. The restaurant Tilveran is located in the heart of Hafnarfjordur, right by the harbour in a friendly setting. Cozy place with personal services. VOX Restaurant is an exquisite venue for a tasteful night out. Whether you’re in the mood for an international dish or something local to Reykjavík, our restaurant’s menu is sure to please. As the name suggests this is an American-style chain restaurant serving real burgers, steaks and more. Trendy lounge-style bistro-bar with a Scandinavian focus on the menu. A small and charming, authentic Thai restaurant located just above Hlemmur bus station. A cozy restaurant, specialising in Italian style pizza, pasta, lamb and fish courses. Restaurant Fish Market uses Iceland’s freshest ingredients to prepare original fish, meat and sweet dishes with a modern twist. We buy direct from the country’s farmers and fishermen to guarantee the sustainability and quality of our dishes.No lunch. Open from 18:00. Book in advance but walk ins welkome ! At the Viking Restaurant Fjorugardurinn, the décor is in the Viking style and a true Viking feast is offered with traditional meals served in old-fashioned Viking-style trays. Grandi Mathöll is the obvious destination for anyone who loves to explore delicious food, quality products and culture. It is a unique street-food hall in the old harbour district of Reykjavík. Located on the famous Laekjargata in the heart of Reykjavik City, Hard Rock Cafe Reykjavik contains three floors, each with its own distinctive vibe. We use a lot of fresh quality products so that your experience reflects the great Icelandic produce. Casual thai restaurant in downtown Reykjavik, large portions at a reasonable price. A diverse menu is offered, focusing on Icelandic ingredients. We take the good old traditional recipes and the best Icelandic ingredients to create fun and tasty food. A popular oriental fast-food chain, with takeaway and home order services. All the food is MSG free. Orient Express caters food prepared by professional Indian chefs. For a decade, Rakang Thai has received guests who want to experience Thai culture and food in a very special category, with only the best ingredients in the dishes. A fantastic, fresh and fun South American restaurant, with a hint of Asian influence so our chefs can create even more exciting and tastier food. Ruby Tuesday's goal is simple that our customers enjoy delicious food and delicious food in a relaxed atmosphere. Scandinavian offers a variety of dishes in a cozy atmosphere. Early until late, Slippbarinn is where you can experience Reykjavík like a local while enjoying exciting events such as live jazz, dj‘s and refreshing pop-up shows. The Steakhouse is in the popular restaurant hub around the Reykjavik harbour. Sushi Social offers a unique fusion of Japanese and South American cuisine combined with the freshness of Icelandic ingredients. In the last decade or so, there's been what is best described as a revolution in the culinary scene of the Nordic countries. Reykjavík is no exception there, with new gourmet restaurant popping up regularly alongside more established classics. If you're looking for something where art meets food, here are our editor's suggestions. Út í Bláinn Bar and Restaurant, serves classic European cuisine and cocktails with modern twists, using fresh Icelandic ingredients. Apotek Kitchen + bar is located in one of the most beautiful corners of Reykjavík. The restaurant is casual-smart, offering delicious food in a vibrant atmosphere and stylish surroundings. Great burgers served in a cozy no-frills enviroment! American pizza chain with takeaway or home ordering. The idea behind Essensia was to open a restaurant in Iceland where people can come together, have a good time, enjoy high-quality cuisine in a casual atmosphere and have a chance to taste a selection of courses. We are proud to welcome you to pop in anytime and try one of our delicious fish dishes in our little, cozy fish shop – you won´t regret it! Forréttabarinn is a popular tapas restaurant that specialises in starters and is located close to the Old Harbor. In the Wintergarden at Smáralind shopping mall you will find a world known restaurant T.G.I. Friday's. Grand Hotel Reykjavík‘s newly opened Grand Restaurant welcomes you to its magnificent, modern and elegant surroundings, where you can enjoy culinary art at its best. The factory offers Iceland's best selection of gourmet hamburgers with a nice selection of salads, meat courses and delicious desserts. Welcome to Haust, a unique restaurant centrally located in Reykjavík. The menu focuses on fresh Icelandic produce cooked to perfection by our skilled chefs. A cosy restaurant and reasonably priced, located in a fisherman's hut on the harbour front. 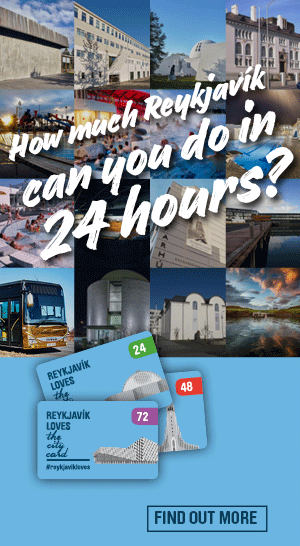 There are more ice cream parlors in Reykjavík than there are swimming pools. Icelanders are nuts for ice cream, and the selection of this small city is pretty impressive. Popular Icelandic pizza place with a versatile menu which includes several vegan pizzas and other options. Kínahofið, or Chinese temple in Icelandic, has been operating for 35 years. It serves fresh Chinese food daily and is renowned for its good service. International cuisine, variety of seafood and steaks, craft cocktails, big wine list, lively atmosphere, friendly service. Large bakery with an adjoining café on Laekjargata in the city centre. Matwerk is a trendy New Nordic restaurant. Serving a selection of experimental dishes, they offer meat, fish, and creative vegetarian dishes. Pizza and lunch specials with takeaway services. Red Chili offers quality food for a reasonable price. We emphasise on Mexican-style food. Reykjavík Kitchen is a brand new family owned and run restaurant in the heart of Reykjavík. Roadhouse - the taste that brings you back! You choose a combination from the menu or make up your own, and we make it for you in a flash. We make our sushi by order to ensure maximum quality and freshness. The Coocoo’s Nest is a small family restaurant located in Reykjavik Iceland, inspired by California and Italy. The Sea Baron (Saegreifinn) is becoming world famous for the “Worlds Greatest Lobster Soup” that so many people have already tasted, from all around the world. Visiting supermarkets in foreign countries can be a lot of fun. Or perhaps or you're on a budget but still want to learn about the local cuisine. Either way, we've compiled a definitive list of Icelandic stuff to get at the grocery store.